Need info about Oktoberfest Celina in Celina, Texas 75009? We Have All You Need for Celina Oktoberfest Costumes. Fall is the best time for Outdoor Festivals and Celebrations. For costume lovers it’s Heaven. Oktoberfest is your Chance to Show off your Costume Skills! Here you will find Full Details about Oktoberfest @ Celina’s Downtown Historic Square, 312 West Walnut Street, Celina, Texas 75009. We have all the information including Event Times, Event Maps, and Event Ticket Links. Don’t Forget to stop by Dallas Vintage Shop to Dress yourself in this Traditional Dirndl or check out more Oktoberfest costumes and get out and Enjoy! Oktoberfest Tickets: This Event is FREE!!! 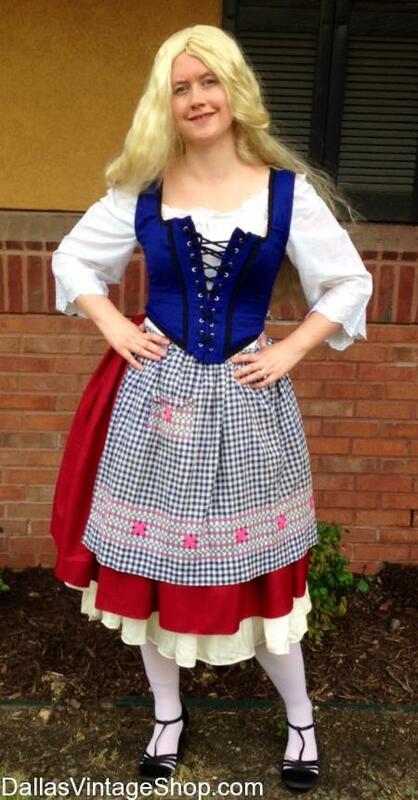 This Oktoberfest Traditional Dirndl Costume Provided By Dallas Vintage Shop.